Monday evening at sundown will begin the Lord's Feast of Tabernacles. This is the final Fall Feast of the Lord's prophetic appointed times, and it designates the Lord's appearance when He tabernacles with us in the Millennial Kingdom. To begin, let's take a look at how God instituted this Feast. Five days after the Day of Atonement, and for seven days, the Israelites celebrated the Feast of Tabernacles, as established in Leviticus 23:33-36. For ancient Israel, it was a time of rejoicing at the end of the fall harvest. We are commanded to rejoice and celebrate during the Feast of Tabernacles (Sukkot) for the blessing of God’s provision and care in our lives. For the ancient Israelites, it was one of the three Feasts in which they were commanded to come to the Temple in Jerusalem, so they traveled from near and far, living in tents (or booths) during the seven days of the Feast. We will see that the commandment to come up to Jerusalem has prophetic significance for us, as well. Today, modern Jews still erect temporary shelters and reside in them for seven days, as they look forward to the appearance of their Messiah. The Old Testament significance is that God wanted the Israelites to celebrate the fact that He was in their presence. He had dwelt among them in the tabernacle in the wilderness, and He had been their shelter, their refuge for them in the wilderness. For us Christians, the New Testament significance is that the Feast of Tabernacles represents the Lord’s shelter in the world to come, when He will dwell with us during His Millennial Reign. I just love the history and tradition of the Lord's Feasts, and the Feast of Tabernacles is full of spiritual import. It was a time of great rejoicing following the mourning and repenting of The Day of Atonement (Yom Kippur). The Rabbis of old referred to it as “the holiday”. It was one of the three holidays in which all Jewish males were required to go to Jerusalem and appear before the Temple of God; therefore streams of people would come from surrounding cities and foreign countries to celebrate. The goal was to arrive by the afternoon of Tishri 14 (according to the Hebrew calendar), allowing enough time to build a booth to celebrate the feast. During Tabernacles the people brought their tithes and offerings to the Temple because you were not to appear empty-handed. Three ceremonies marked the next seven days of joy and celebration, and they all point to Jesus as the Messiah and our Savior. The first ceremony was called the Water Libation Ceremony. Remember that Israel was an agricultural community and depended heavily on their harvests to survive. Therefore, rainfall was extremely important. The rainfall in Israel and Jerusalem is about 20 inches per year, with most of it falling in November – March. (On average, we get about 38 inches per year in my part of Texas). Without a sufficient amount of rain, the crops would not survive and the nation of Israel would be in dire straits. And here is where the spiritual aspect begins to overlay the physical reality ... The people were very much aware of their dependence on God for the rains (and water) that were so vital for the preservation of life. Each morning of the Feast, the High Priest would take a golden pitcher and exit the Water-Gate, making his way to the Pool of Siloam and fill up the pitcher. There would be a great procession of music and worshippers that accompanied him. He would return, via the Water-gate, to the Court of Priests where the Altar was located. As he entered, three blasts of the silver trumpets sounded from the Temple. The priest would then say, “Therefore with joy you will draw water from the wells of salvation” (Isaiah 12:3). Keeping in mind that water represented life, in terms of an abundant harvest, consider the meaning of what Jesus said, when after his entry into Jerusalem, He taught in the Temple: “Now on the final and most important day of the Feast, Jesus stood, and He cried in a loud voice, If any man is thirsty, let him come to Me and drink! He who believes in Me [who cleaves to and trusts in and relies on Me] as the Scripture has said, From his innermost being shall flow [continuously] springs and rivers of living water” (John 7:37-38). Here is the continual pouring out of Living Water that was so important to Israel’s survival … physically and spiritually! The next ceremony that was celebrated is the Temple Lighting Ceremony. This ceremony was held on the evening of the first day of the Feast, when the people would crowd into the Court of Women; a barrier separating men from women being raised. In the center of the Court of Women stood four huge menorahs to light the courtyard. The wicks for these menorahs were old priestly garments. (It would be a Holy Fire!) Young men would climb ladders 50 feet tall to light the bowls filled with olive oil. This celebration was repeated each night for the next six nights, as the lighting of the Temple reminded people of how God's Shekinah glory had once filled His Temple. 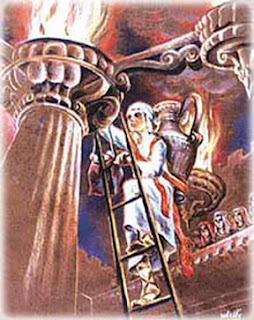 On the last night of the Fire Ceremony in the Temple, the people recall the manifestation of God's physical presence with them as He led them in the Pillar of Fire through the wilderness. They also remembered the promise that He would send the "Anointed One", the Messiah, who will be a "Light" to His people, and who will lead them to be a "light" to the nations of the world. And here's what the Israelites did not understand (and where God is so amazing in His revelations): Jesus was in Jerusalem, celebrating the Feast of Tabernacles, and teaching in the Temple. The people did not understand that, in the person of Jesus, God's glory was once again present in that Temple! And Jesus used this celebration to announce that very fact. He was teaching in the Court of Women just after the Feast of Tabernacles, perhaps standing right next to those magnificent candelabras when He declared to all who were gathered there, "I am the light of the world. Whoever follows Me will never walk in darkness, but will have the light of life" (John 8:12). The final ceremony of the celebration of the Feast of Tabernacles is called the Hoshanah Rabbah Ceremony; also known as "The Great Salvation". This ceremony occurred on the seventh day of the Feast of Tabernacles. It represented the final day of the Fall harvest for the Israelites. 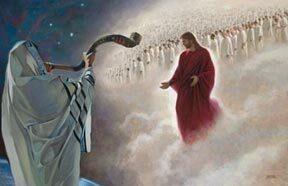 Today, the significance for the Jews is that it will represent the time when Israel, as a nation, has repented and Yeshua returns to the earth. They will have declared, “Blessed is He who comes in the Name of the Lord!” For the world, it is also a picture of the celebration of the gathering in of the final harvest of souls in God’s Plan. If the Feast of Tabernacles represents the Millennial Reign of Christ (when He dwells on earth for 1,000 years), then this final day of the Feast is the end of that reign -- when the final harvest of souls is celebrated, and final judgment will be delivered at the Great White Throne. There is much rejoicing on this last day, as the harvest of souls is completed. As our home church gathers together to celebrate the Feast of Tabernacles, I am in awe of God as He reveals His Sovereignty throughout the ages. He established external and physical significance to this Feast for the ancient Israelites, and offers internal and spiritual meaning and hope for all those looking for the presence of the Messiah in their lives. We will come together for a joyous meal and review both the historical and eschatological implications of the Feast of Trumpets. We will read Scripture, and recite a prayer, honoring God's Feasts, His Holy Days: Blessed art You, LORD our God, Master of the universe, who has given to us holidays, customs, and seasons of happiness for the glory of our Lord Yeshua, the Messiah, the Light of the world. We will hold up a glass of wine, reciting together: Blessed art You, LORD our God, Master of the universe, Creator of the true fruit of the vine. You have prepared a table for me in the midst of my enemies, you anoint my head with oil, my cup overflows. We will then eat of the unleavened bread, declaring together: Blessed art You, LORD our God, Master of the universe, who gives us the Living Bread from Heaven. We will then eat, rejoice, and commune together as we celebrate the time when the Lord returns, and the survivors from all the nations will go up, year after year, to worship the King, the LORD Almighty, and to celebrate the Feast of Tabernacles and God dwelling with us (Zechariah 14:16). My spirit is telling me that this day is in the not so distant future. Until then, let us declare together, Next Year in Jerusalem! There is so much history, tradition, and spiritual significance to this Holy Feast Day, that it is impossible to contain it all in one blog posting. But I hope this has given you enough insight that you will want to research it yourself, and gain the blessings that come from celebrating the Lord's Feasts. John 1:14 "And the Word became flesh and dwelt [tabernacled] among us, and we beheld His glory, the glory as of the only begotten of the Father, full of grace and truth." Yes, Rory, I have found this website to be very informative. 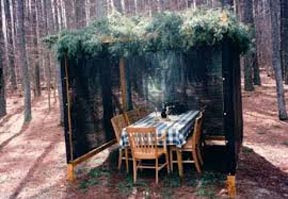 Happy Sukkot!